HOUSTON, TX--(Marketwired - Jul 14, 2016) - There may be few things as stressful for parents as discovering their baby has a birth defect, even if it is not life-threatening. According to Dr. Phileemon Eric Payne, a craniofacial and plastic surgeon in Houston, ear deformities affect as much as 15 percent of newborns. 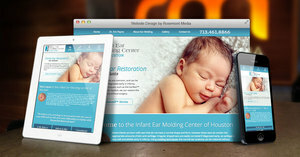 His new responsive website, designed in collaboration with medical marketing agency Rosemont Media, is intended to help parents of infants with misshapen ears find information on non-surgical treatment. Outfitted with descriptions of common ear abnormalities, step-by-step directions of the treatment process, and a gallery of before-and-after photos, the new site offers expertise and effective solutions to worried parents in Texas. Dr. Payne says that ear molding treatment must be completed early in life, within the first one to two weeks. Therefore, he says it is imperative that parents can easily access the site from virtually anywhere by using their mobile devices, something the adaptable design makes possible. Integrated medical SEO strategies help the site rank high on leading search engines, further assisting individuals in locating it online. Easing fears and providing practical advice were additional criteria Dr. Payne wanted to include, and the soothing blue color palette offers a calming environment in which visitors can locate the content they are seeking. The simple site requires no flashy design elements, but instead emphasizes a clean, easily navigable format that allows parents to find what they need quickly. Dr. Payne hopes the website can be a helpful resource and assist parents in finding the best treatment for their babies in a timely manner. Dr. Phileemon Eric Payne is a craniofacial surgeon and a board certified plastic surgeon. He is the founder of the Infant Ear Molding Center and The Craniofacial Plastic Surgery Center in Houston. After earning his medical degree from the University of Texas Medical School, he completed a Fellowship at Medical City Children's Hospital in Dallas. He completed additional fellowship training at the Pediatric Plastic Surgery Institute in Dallas. Dr. Payne trained under Dr. Steve Byrd, the developer of the EarWell™ device. He is available for interview upon request. For more information about Dr. Payne and his practice, please visit infantearmolding.com.